This classic chiffon cake is tender and light as air. 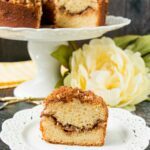 It has the richness of a butter cake and the fluffiness of a sponge cake. It’s also similar to an angel food cake, but more flavorful and moist. I was first introduced to chiffon cakes by my ex-sister-in-law back when I was a pre-teen. She used to make them all the time for all our family dinners. Nancy was a perfectionist. When she made something, she would keep making it until it was perfect. That’s what I admired about her. I haven’t spoken to her since the divorce which is a shame because she was like the big sister I never had. That’s life though, people come and go, and relationships change. Chiffon cake is a type of foam cake, which has a high ratio of eggs to flour and is leavened mainly from the air beaten into the eggs. It’s similar to an angel food cake, but instead of using just egg whites, chiffon cake recipes use the whole egg. This gives a more rich and flavorful taste to the cake, and there is no waste because I never know what to do with the leftover yolks. It’s also similar to a sponge cake which is basically just eggs, sugar, and flour, but there is oil added to the batter. This makes the texture of a chiffon cake more moist and silky. 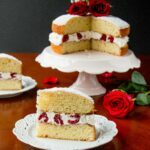 It’s a very simple, yet delicious cake which can be a nice change from all the heavy decadent desserts out there. There are many variations out there, but what I like about this recipe is that there are an even number of egg whites to egg yolks used, so again there is no waste. I kept the flavoring simple with just vanilla, but you can add lemon or even almond extract if you prefer. The rest of the ingredients are all your usual pantry staples. The method is fairly easy. The two most important key to success with this recipe is to make sure you take the time to beat your egg whites until they are very stiff. The second key is to very gently fold the egg yolk batter into the egg whites. Do not stir and make sure the batter is all evenly combined. The final texture of the batter is super fluffy and white. You’ll feel like you are baking a cloud. You can enjoy this cake as is or served with some whipped cream and fresh fruit. You can also cut it horizontally and make it into a layer cake with your favorite frosting. The choice is yours; just have fun with it. This classic chiffon cake is tender and light as air. 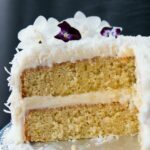 It has the richness of a butter cake and the fluffiness of a sponge cake. Sift the first 4 ingredients into a bowl. Make a well and add the next 4 ingredients. Set aside. In a large bowl, beat the egg whites with the cream of tartar until very stiff. Set aside. Using the same beaters, beat the egg yolk batter. Scrape the bowl as needed. Beat until light in color and smooth in texture. Slowly pour half of the egg yolk batter into the egg whites. Using a rubber spatula, gently fold a few times and then add the rest of the batter in. Gently fold until just combined and making sure there is no yolk batter left on the bottom of the bowl. Pour into an ungreased 10″ tube pan with removable bottom. Bake for 55-65 minutes or until a toothpick inserted into the center comes out clean. The top should be golden brown and spring back when lightly pressed. Let cool completely upside down (see below). Unmold and serve. The cake can be stored wrapped up or in an airtight container at room temperature for up to 3 days. I’ll be sharing this recipe at Fiesta Friday #124, hosted by Angie and co-hosted by Lindy@Love in the Kitchen and Liz@spades, spatulas & spoons.